This is my mum’s Austrian Goulash soup recipe, a hearty stew made with paprika spice, beef, waxy potatoes and Wiener (same as Frankfurter) sausages. Austrian Gulaschsuppe is a typical autumn and winter dish, delicious when it’s cold outside – although it works well year-round in Scotland…! 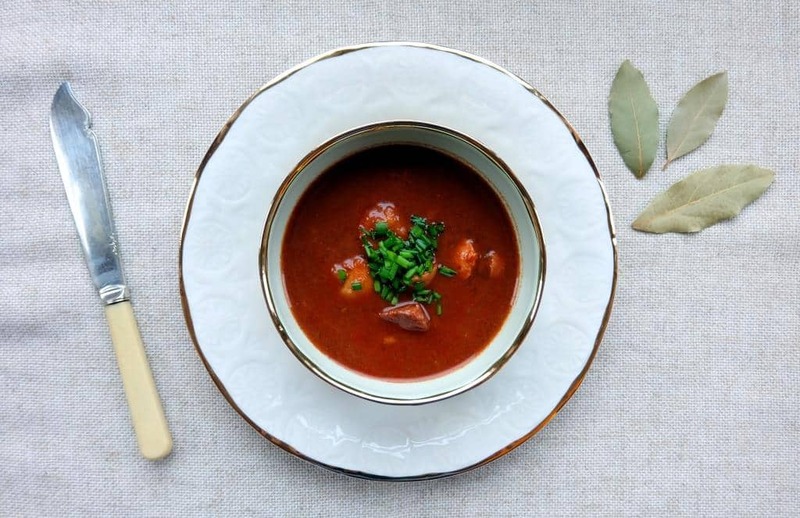 This Austrian Goulash soup recipe serves six people. Best served with slices of Austrian Schwarzbrot such as Hausbrot. I usually make the Goulasch soup a day in advance, it intensifies and improves the flavour and thickens the sauce. Heat the sunflower oil in a large pot (don’t use a non-stick pot for this recipe or the onions won’t brown), add the chopped onions and fry until nicely browned. Take the pot off the flame, then add the mild and hot paprika spice, mild chilli powder and vinegar and stir in the beef cubes until fully coated. Add 250g of water to help with this process. 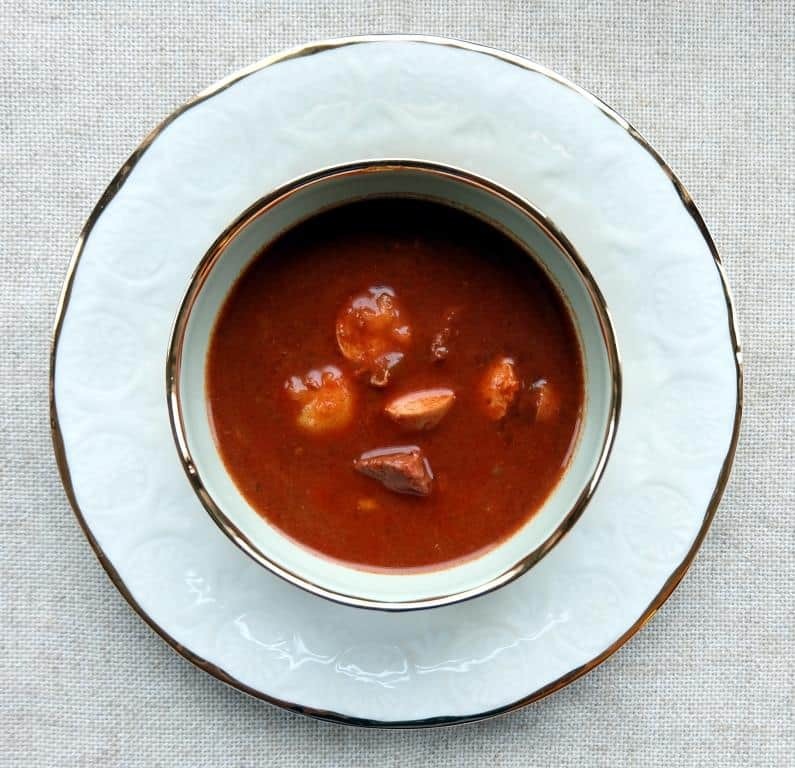 You can dial up the Goulash’s spiciness by replacing the mild paprika with hot paprika. Put the pot back on the flame. Add the bay leaves, caraway seeds, garlic, lemon zest and salt. Stir and simmer for about 5 minutes. Add one litre of hot water to the pot, cover and simmer on a low heat for about an hour or more. Stir every now and then to ensure the stew doesn’t burn or catch on the bottom of the pot. Add the potato cubes and top up with more water to ensure everything is covered. In the meantime, mix the cornflour with 5 tbsp water in a small bowl, then add to the pot. This will thicken the liquid of the stew. Finally, add the Wiener sausages and simmer for a further 10 minutes. Add more salt and vinegar to taste if required. Serve with chives and some dark rye bread.